"Love, curiosity, and kindness make it a great one." That's what Elisabeth Egel says about the planet we all share since experiencing life in the United States on her exchange program from Estonia. Hosted by the Whatley family in Armada, MI, Elisabeth has gone above and beyond the requirements of her U.S. Department of State-sponsored FLEX scholarship. She is excelling academically while enrolled in Advanced Placement History and Honors English classes. Required to give one presentation about her country; Elisabeth has completed seven, which included slides, music, dance lessons, and sweet treats (photo top left). A trained classical pianist, Elisabeth is now learning jazz and 20th-Century compositions, thanks to the piano the Whatley family rented for her. 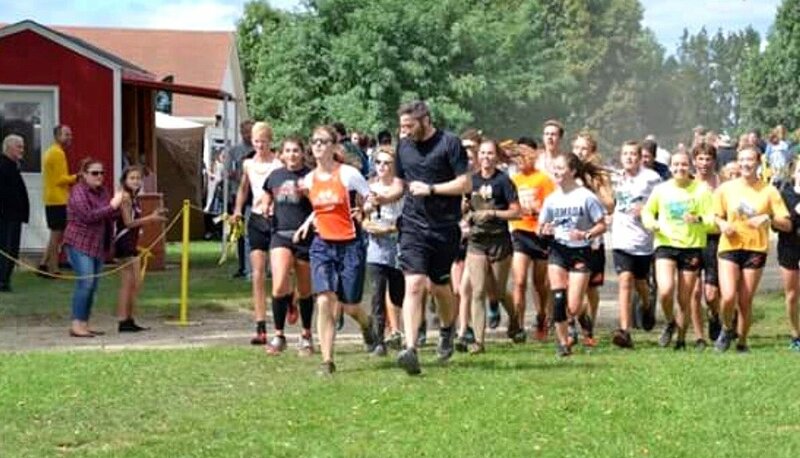 "With the help of my coaches and classmates, I have run in several 5K cross country meets, one of which involved running through a stream and a lot of mud," said Elisabeth. She even led the Whatley family dog through an agility course with the help of an instructor. What makes Elisabeth's program so exceptional? She is totally blind. Elisabeth said, "When I found out that I had a chance to go to the United States...I was not sure if I had the strength and independence that this step required." She found the perfect host parent in Evon Whatley. "Elisabeth is totally blind and I grew up with both blind parents so this was not a problem, in fact, I was quite comfortable and confident in meeting her needs," said Evon. Elisabeth reflected on her past six months and said, "I feel the core values of people are similar and that is what keeps the whole world together." Evon said, "We remind Elisabeth to never stop trying or dreaming, my quote to her is 'The Sky Is The Limit And There Is No Limit To The Sky'. We love her dearly." Learn more about opening your heart and home to an international exchange student and becoming a host family. Find out more about the Future Leaders of Exchange (FLEX) program sponsored by US Department of State. Here are some things you can expect to get out of your exchange year.